This is a more modern arrangement of “In the Bleak Midwinter” based on a poem by Christina Rossetti and the musical setting by Gustav Holst for Clarinet Quartet. 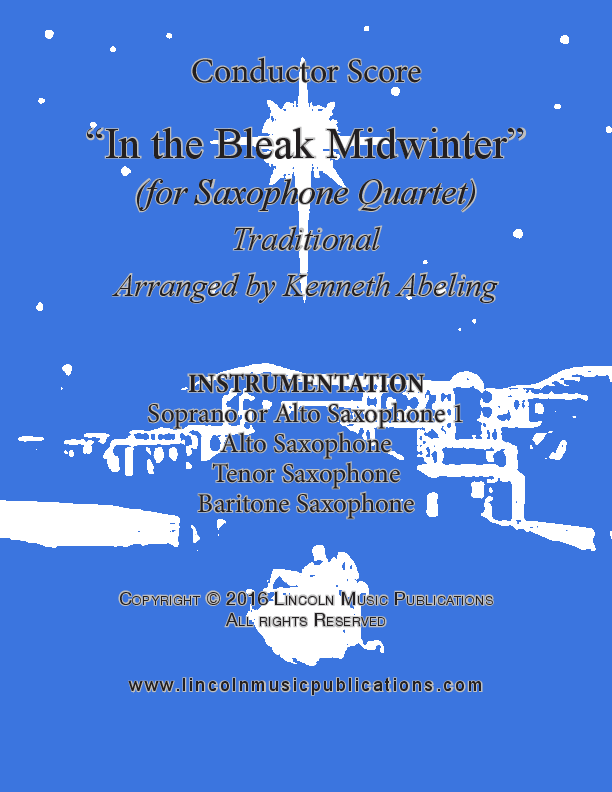 This arrangement of “In the Bleak Midwinter” for Saxophone Quartet is a Christmas carol based on a poem by Christina Rossetti with the musical setting by Gustav Holst. Both the Soprano Sax and an Alto Sax for Soprano part are included. This is a more modern arrangement of “In the Bleak Midwinter” based on a poem by Christina Rossetti and the musical setting by Gustav Holst for String Quartet. This arrangement of “In the Bleak Midwinter” for Woodwind Quartet is a Christmas carol based on a poem by Christina Rossetti with the musical setting by Gustav Holst. This is a more modern arrangement of “In the Bleak Midwinter” based on a poem by Christina Rossetti and the musical setting by Gustav Holst for Saxophone Quintet.